A panel of six local authors will present a WRITERS’ WORSKSHOP: LESSONS LEARNED ON THE WAY TO PUBLICATION on Saturday, May 5, 2018 from 10:00 am to 1:00 pm. This FREE step-by-step workshop, based on the authors’ personal experiences, is geared toward BEGINNING WRITERS—most especially those who want to write for publication. The authors welcome your curiosity and questions! Register online for this FREE event now. We look forward to our time together. SUSAN H. CALL (Non-fiction and Speaker): Susan Call holds a Masters in Science Degree in Marriage and Family Therapy from Eastern Nazarene College in Massachusetts, and a Bachelor of Arts Degree in Computer Susan lives in Londonderry, NH. A Search for Purple Cows, a memoir published by Guideposts Books, is a story of hope and healing. ELEANOR GUSTAFSON (Literary & Biblical Fiction): Ellie graduated from Wheaton College in Illinois—where she met her husband, Jim, while teaching horsemanship. She and her husband live in Haverhill, MA. Ellie’s last two books from Whitaker House include The Stones – A Novel of the Life of King David and Dynamo. She has another novel coming out this July entitled, An Unpresentable Glory. RALPH D. JAMES (Short Stories): Long ago, a high school creative writing teacher told Ralph he had an excellent grasp of the absurd. In 2014, he retired after forty years in the engineering and construction industry. His lovely bride, Clarice, a writer herself, suggested he try his hand at writing again. 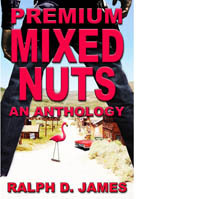 The result was his anthology, Premium Mixed Nuts. Perhaps his teacher was right. Ralph and Clarice live in New Hampshire. JEREMIAH PETERS (Speculative Fiction): Jeremiah has been a natural storyteller his whole life. He has been a pastor with the Primitive Methodist church of the USA since 1979. Over the years, he’s been a guest speaker at many youth retreats and rallies. He and his wife, Jodie, have raised six wonderful children and have ten grandchildren. They live in Sandown, NH. His book A Message to Deliver was published by HopeSprings Books. KONNIE VINER (Non-fiction): Konnie wrote Rested Soul, Resilient Heart to help women find hope and healing by trusting in God’s unconditional love and faithfulness. She is a former crisis center advocate, founder of a ministry for abuse victims, and leader of abuse support groups. She has a B.S. in Education from the University of Kansas and M.S. in Business Management from the University of Redlands, CA. Konnie resides in New Boston, NH. This entry was posted in Writing and tagged Workshop. Bookmark the permalink.